When we were moving to Texas we stopped on the East Fork of the Trinity several days to rest. There were some eighteen or twenty immigrant wagons along, and we were a pretty jolly crowd. The fourth day of July found us here in camp, and we thought we ought to celebrate our great national birthday; so we had the biggest sort of a dance upon the green grass of the prairie. The fattest yearling in the herd of cattle was killed and barbecued; and perhaps no festive occasion was ever more enjoyed than that 4th of July was by us—a little band of pioneers on this, the Texas frontier, at that time. This is the earliest documented reference to barbecue in the history of the Dallas area. It’s interesting that they celebrated the Fourth of July with such glee, since of course they were no longer in the United States. At the same time in the 1840s and 1850s when settlers like the Prigmore family were moving into north Texas, ranchers in Texas had begun sending cattle to railheads in Missouri. One of the earliest Texas cattle trails, the Shawnee Trail, forded the Trinity in the Dallas area. From here it went north to Oklahoma either by the Military Road (Preston Road) or by other branches of the trail, then through eastern Oklahoma where it was called “The Texas Road,” through a little corner of Kansas, and then on into Missouri. By 1842, Chickasaw people in Oklahoma operated a ferry across the Red River at a point east of Coffee’s trading post; this was known as Colbert’s Ferry from 1849 and it was also used as a river crossing in addition to the ford at Preston Bend where Coffee’s Station was located. The trail from Colbert’s Ferry down to Dallas became an alternative to the Preston Road to its west. Benjamin Prigmore’s family seems to have followed this branch of the trail, since his account states that they camped on the East Fork of the Trinity, near the present site of McKinney, Texas. The Shawnee Trail served as an immigrant road for thousands of settlers moving to north Texas before the Civil War. We have to imagine large groups of settlers with their wagons and families, their horses, mules, dogs, pigs, and chickens, moving slowly southwest along the trail, passing herds of cattle moving northeast, all under the very interested eyes of native peoples scanning the area. We must also imagine enslaved people accompanying some of the early settlers. Slavery had been illegal according to the laws of Mexico, but it was legalized in the Republic of Texas. One of the principal grounds of opposition to the annexation of Texas on the part of United States was that it would bring another slaveholding state to the union. The practice of human slavery existed for two decades in the Dallas area, from the time of the earliest settlements in the 1840s to June 19, 1865, when federal troops in Galveston announced the enforcement of the Emancipation Proclamation in the state. Slavery did not last in this area beyond the first generation of settlers, and in this respect also the culture of early Dallas differed from that of most southern states—even border states like Kentucky—where slavery had been an entrenched institution across multiple generations. The earliest federal censuses taken in Texas show 207 enslaved people in Dallas County in 1850 out of a total population of 2,743 (8%), and then 1,074 enslaved people in 1860 out of a total population of 8,665 (12%). In the latter year, just before the Civil War, there were 228 slaveholders in the county. Percentages of enslaved people in Dallas County were considerably lower than those for the state of Texas as a whole: 27.4% of the state’s population in 1850 as opposed to 8% in Dallas County, and 30.2% of the state population in 1860 as opposed to 12% in Dallas County. 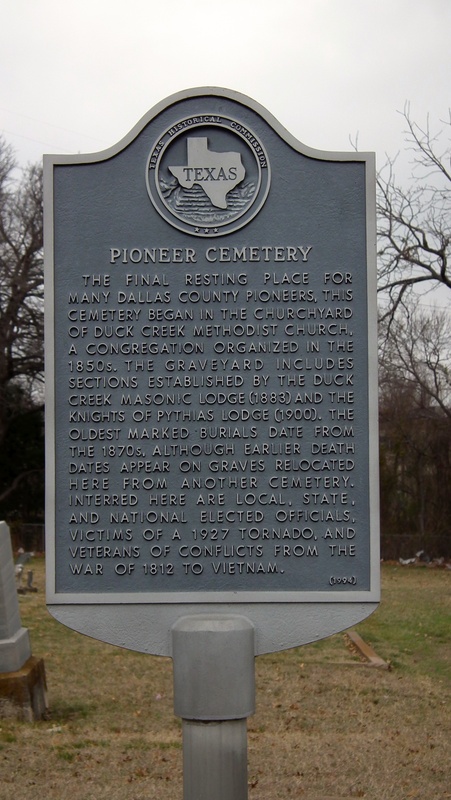 Texas State historical marker at the Garland Pioneer Cemetery, noting the earlier Duck Creek settlement. In the period before the Civil War, other communities were developing in Dallas County. Settlers on Duck Creek, a tributary of the East Fork of the Trinity, established a community by that name northeast of Dallas in 1846. Duck Creek would later become Garland. In north central Dallas County was a settlement known as Breckinridge, organized in the early 1850s. It was a predecessor of Richardson. In the southwest of the county, settlements were begun at Cedar Hill (1851) and Lancaster (1852). After statehood, the US military developed a scheme to build a line of forts to shield settlers from attacks by native peoples. One of these was Camp Worth, established on the West Fork of the Trinity about forty miles west of Dallas in 1849. It was renamed Fort Worth, but did not function long as a fort. It would become a community of settlers and eventually Dallas’ sister city to the west. By the late 1850s, Fort Worth vied with Birdville, the older settlement at the site of Bird’s Fort, to become the county seat of Tarrant County. In 1860, it succeeded in that contest. Farther afield, towns and communities were growing on the prairie around Dallas. To the north, McKinney was founded in 1848, growing from a smaller settlement named Buckner (1841/2) to its west. McKinney became the county seat of Collin County. Farther north, the town of Sherman had been created as the county seat of Grayson County in 1846. Originally on the Preston Road, the town site was moved to the east in 1848 on the road from Colbert’s Ferry. The eastward movement of both of these communities suggests a shift away from the Preston Road toward the eastern branch of the trail that came down from Colbert’s Ferry, what would eventually be called the McKinney Road in Dallas. To the south of Dallas, Waxahachie was established as the county seat of newly created Ellis County in 1850. Farther south of there, the town of Corsicana had been established in 1848 and was named in honor of the Corsican mother of José Antonio Navarro, an early supporter of the movement for Texas independence. 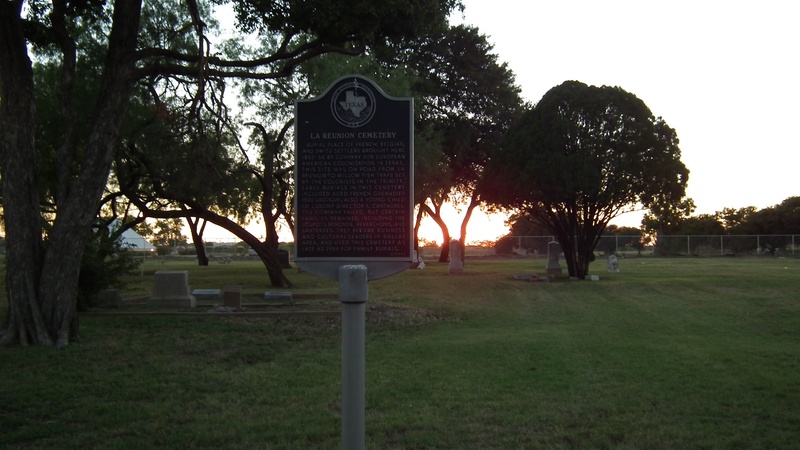 To the southeast of Dallas, a small community called King’s Fort and then Kingsboro, founded in the 1840s, was renamed Kaufman when the county by that name was created in 1852. In early 1855, Dallas may have looked like many of these villages of settlers in north Texas. Then the French socialists showed up. In the decades following the defeat of Napoleon (1814), France had entered a long period of instability partly fueled by idealistic political and social ideas. At the same time, developers were hawking the glories of Texas to European peoples and this would result in an influx of Prussian and other German-speaking settlers to Texas as well as a unique colony of French-speaking people who landed on the west banks of the Trinity in 1855. Inspired by the utopian and communalistic teachings of François Marie Charles Fourier and books about Texas, a group of about 200 French and French-speaking Swiss and Belgian colonists led by Victor Considérant came to Galveston and then walked overland to Dallas, arriving in April 1855. The colony they called La Réunion had around 350 settlers by the next year, but it didn’t last. The settlers had little expertise in agriculture and chose poor land. By the end of January, 1857, the colony was formally disbanded. Some of the settlers remained and became part of Dallas, contributing expertise in brewing, graphic arts, music, watchmaking, and shop keeping. The 1860 census for Dallas County showed 85 persons born in France, and the great majority of these must have been remaining Réunion settlers. Reverchon Park in Dallas is named for one of the colonists, Julien Reverchon, who remained in the Dallas area. Remond Drive and Santerre Avenue in Oak Cliff are also named for Réunion colonists who remained in the area. Reunion Tower, a signature of the Dallas skyline that opened in 1978, looks across the Trinity to the site of the old colony for which it is named. As settlements were growing in the Dallas area before the Civil War, infrastructures that connected the area to Texas and the United States were also evolving. The Republic of Texas had authorized the establishment of a Central National Road, which was surveyed in 1844 and led from Dallas northeast to the Red River at a point west of where Texarkana is today. The road seems to have been little used and superseded by an older east-west road that ran from Dallas to Shreveport, Louisiana. In 1849, Americans heading to California used a ford of the Elm Fork of the Trinity north of the fork with the West Branch. It came to be called California Crossing. In the mid-1850s the Butterfield Overland Stage came down from Missouri through Colbert’s Ferry and down to Sherman where it turned west, bypassing the Dallas area. But by the late 1850s, stagecoach routes had been established through the Dallas area, connecting the city with Austin and San Antonio to the south and with Shreveport, Louisiana, to the east. In the same era, just before the Civil War, stagecoach lines extended north and west from Fort Worth.